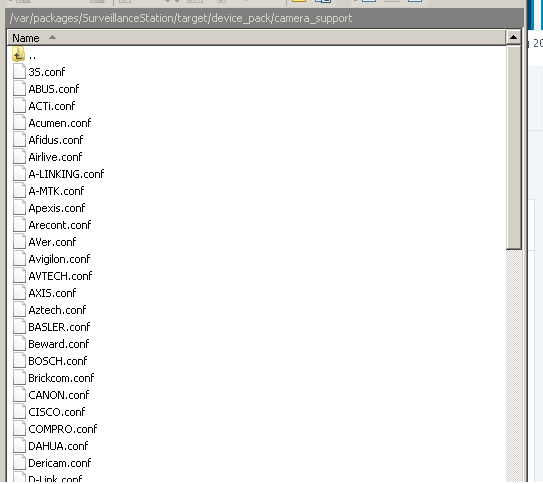 Hi, great post and very usefull but i have a problem whe I try to upload the file Xiaomi.conf configuration and store it witch WinSCP at /var/packages/SurveillanceStation/target/device_pack/camera_support, I cannot see this directory, only my own directories not the system. Do you know why? What do u mean by “own directory”? can you show me ur screen shot? You should see something like below here. I have the similar issue with as Bender. I only see my home directory. 4X 1080p dome like this here https://fr.aliexpress.com/item/International-Edition-Xiaomi-YI-Dome-Home-Camera-112-IP-Camera-1080P-Xiaoyi-360-PTZ-WiFi/32765921619.html <—international version USA server, it's working fast but i wanted to put them on my synology server. This version is chinese locked (working in my country, French caribbean usa location) but this is cloud slow…i canted to unlock and put them on my synology server. Would you mind give a try to these models if possible ? I can try to give you all infos possible and help you if you need, for the time you'll spend helping me.